"Africa's conservation leaders of the future; your work has just begun." 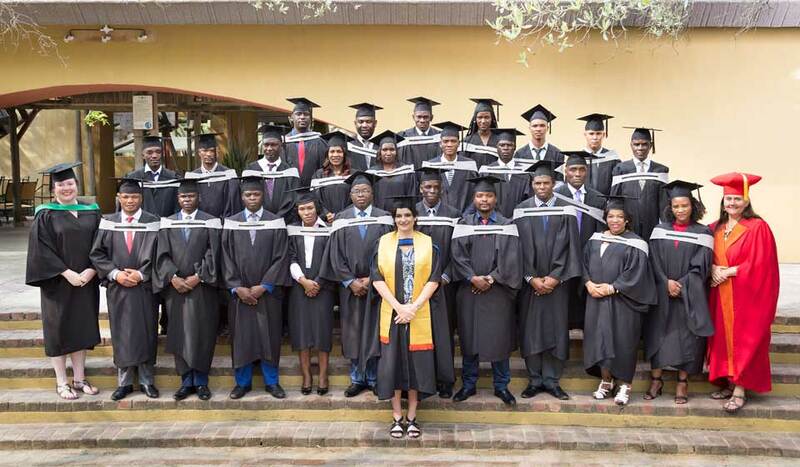 This was the message shared with the 46 men and women who graduated from the Southern African Wildlife College (SAWC) on 29 November 2017. 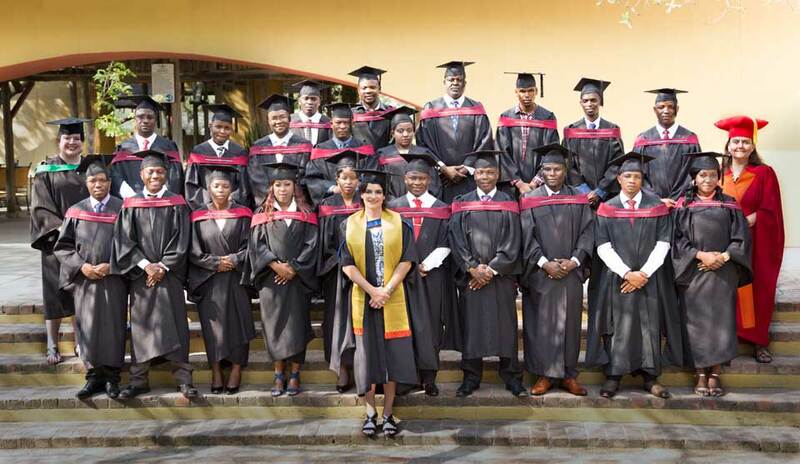 This was the message shared with the 46 men and women who graduated from the Southern African Wildlife College (SAWC) on 29 November 2017. 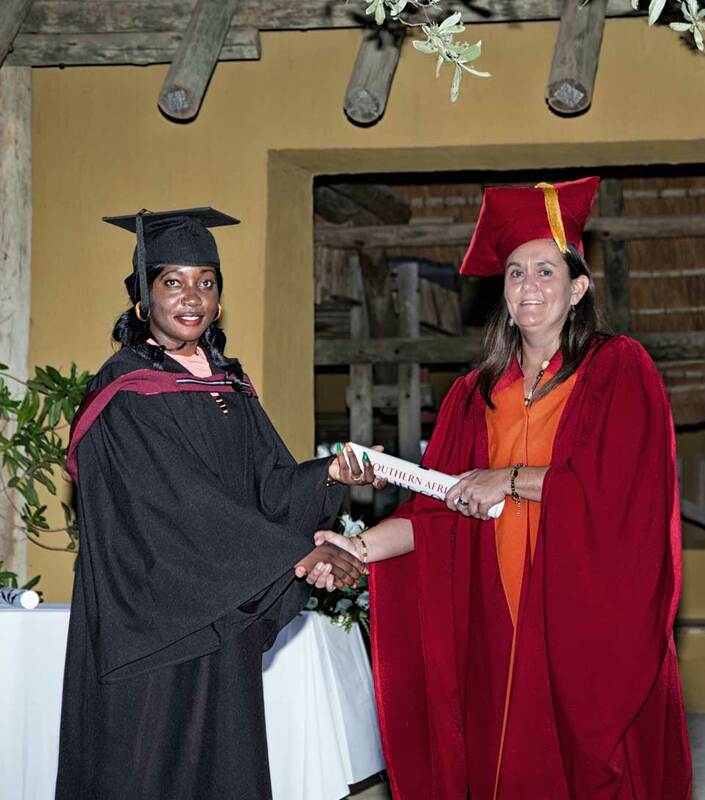 During the ceremony, three graduates also received life-changing scholarships from the Southern African Wildlife College Trust. 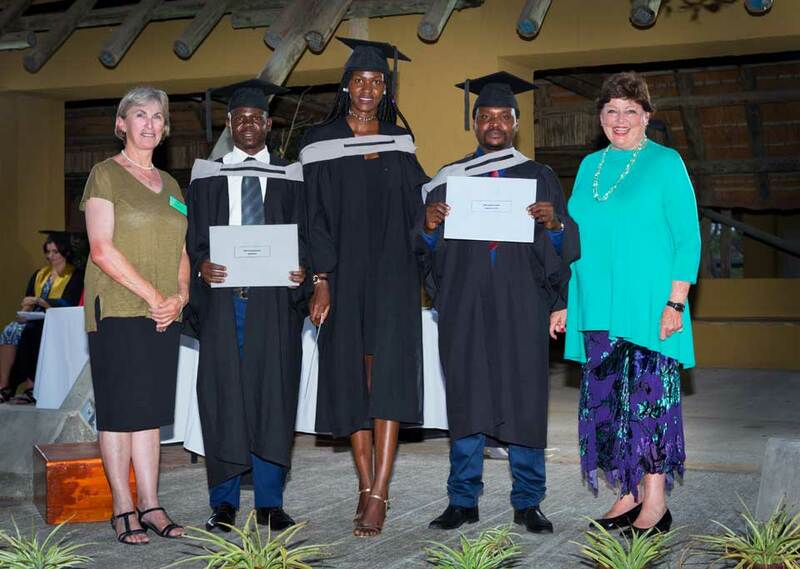 Hailing from seven African countries, the graduates received their Higher and Advanced certificates in Wildlife Area Management from SAWC Vice Chancellor and CEO, Theresa Sowry at the college campus in the Greater Kruger National Park. The college, founded in 1996, has been offering wildlife area management qualifications for 20 years. This year the countries represented by the graduates included Lesotho, Malawi, Mozambique, Namibia, South Africa, Zambia and Zimbabwe. The occasion was marked by the presence of key donors, supporters and partners of SAWC, including representatives of WWF South Africa, Peace Parks Foundation and the Southern African Wildlife College Trust. “Our donors make everything possible,” said an impassioned Sowry, thanking them for their ongoing commitment to the college and its growth over the past two decades. “Today I must especially thank, the MAVA Foundation who through PPF supports 35% of Higher and Advanced Certificate students’ course fees as well as Friends of African Wildlife, our Zürich- based funding partner, who this year supported 26 student bursaries across various programmes including this one,” she said. The college’s growth and its contribution to developing critical management capacity for protected areas in SADC was a common theme for all the guest speakers. Dr. Yolanda Pretorious, who manages the Wildlife Area Management Qualifications at the SAWC, spoke about how education and the conservation industry are changing. “Your role is now – more than ever before – about sustainably managing natural resources in partnership with communities, not in isolation,” she noted. She reminded the “passionate” graduates to see themselves as stewards when they return to their respective countries, with an obligation to always do the right thing, “even when nobody is watching”. 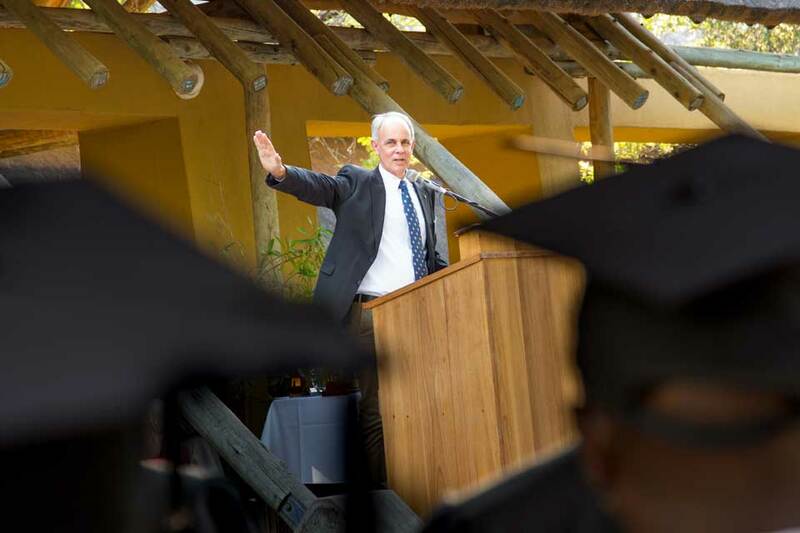 Paul Bewsher from Peace Parks Foundation advised the graduates to be motivated by “love for community, work and the environment”, while SRC president Jacob Colani Mdlovu from the Kruger National Park, South Africa, hailed the graduates as “advocates, fighters, educators and ambassadors,” for conservation in a heartfelt address. During the ceremony five students were also awarded for their resilience and the hard work shown throughout the year. The awards went to Mercy Kaligande from Malawi Department of National Parks and Wildlife, who received the Rosie Sturgis Award: Most Improved Student; Jacob Colani Mdlovu: Kruger National Park – the WWF-SA Award: Most Outstanding South African Student; Noble Mumbi: Zambia Department of National Parks and Wildlife – the Hans Hoheisen Award: Best Protected Area Management Student; Rosslyn Nothando Moyo: Zimbabwe Parks and Wildlife Authority – the SAWC Award: Best Financial Management Student and George Kamuzhu Phiri: Zambia, Zambian Carnivore Programme (Thornicroft Lodge) – the SAWC Award: Best Animal Studies Student. The two Distell Foundation Awards for Best Students overall were awarded to George Kamuzhu Phiri: Zambia, Zambian Carnivore Programme (Thornicroft Lodge) in the Higher Certificate: Nature Conservation: Conservation Implementation and Leadership and Richard Mahlangu: Zimbabwe Parks and Wildlife Management Authority in the Advanced Certificate: Nature Conservation: Trans-frontier Conservation Management. “The SAWC honours these students, its partners and donors and the work being done to conserve our natural resources,” said Sowry. The sought-after Southern African Wildlife Trust (SAWCT) scholarship awards went to the three highest achievers in the Higher Certificate class namely George Kamuzhu Phiri: Zambia, Zambian Carnivore Programme (Thornicroft Lodge), Selma Njahi Sikopo: Namibia, Lusese Conservancy and Noble Mumbi: Zambia, Department of National Parks and Wildlife. The scholarships will give these students the opportunity to continue with their studies and complete the Advanced Certificate programme in 2018. In closing, Dr. Leonard Sefu, SAWCT Founder Trustee, former director of the Department of National Parks and Wildlife, Malawi and member of the SADC Wildlife Technical Committee, was an inspirational figure, sharing his memories about the foundation of SAWC in 1996 and his impressions of the impact it has on conservation in southern Africa. He cautioned against the terrible threats the natural world faces and noted that graduates will be responsible for more than just their country’s natural resources; transfrontier conservation areas are vital too. Advising them to be the best version of themselves in their commitment to their work, he said the graduates should “network with one another, write proposals and ask for support” to carry out their responsibilities. Sowry concurred, highlighting the need to combine efforts, create partnerships, and pool resources, given the increase in poaching and wildlife trafficking that threatens to disrupt and collapse vital ecological processes. “With the cooperation and involvement of local communities, these graduates will be responsible for rehabilitating and sustaining our wildlife areas in collaboration with many stakeholders. Your organisations are lucky to have you in their ranks,” she said. Founded in 1996 the Southern African Wildlife College has been empowering people working in conservation to manage and preserve some of the world’s most biologically diverse areas. It has trained over 15,000 people within the conservation and environmental sectors. This includes natural resource managers, wildlife law enforcement officers and monitors, field rangers, field guides, youth wanting to bridge into the conservation and environmental education sector, youth involved in environmental services and members of local communities, amongst others. IFAW Grant to support and enable the highest possible standards and best practices for the welfare of dogs working in the service of wildlife conservation at the College. With 35 years of experience as an expert houndsman in Texas, Joe Braman is uniquely qualified to help shape the College’s K9 programme. He is bringing his crime-fighting, dog-training expertise to the Southern African Wildlife College.